Having an outstanding customer support service has always been central to what we do at Customer Thermometer. We’re keenly aware that our software helps people deliver excellent and thoughtful support. And so the onus is on us to deliver it to our own customers. Day in, day out. Until about 2 years ago, we (as co-founders) handled all customer support service. Mark and I love supporting customers; understanding their businesses and helping them retain their customers. We continue to handle tickets personally to this day, as in our view it’s one of the best ways to understand how to deliver even greater value to our customers. So when we hired our first support person, we discussed with him our earnest desire that the customer support service function continues to be at the heart of what we do. I’m a firm believer that the quality of your support, and the way you do business, can have a huge effect on your reputation and growth. It’s basically free marketing if you get it right. To this day, we do not undertake any paid acquisition activity, and continue to grow through word of mouth. Testament to our approach, for sure. Mark and I were aware that bringing in a new hire would (and needed to) bring new thinking to the way we handled our customer support service. We needed to grow a brand new team brimming with enthusiasm and commitment to customers. We needed that team to have an identity and an ethos that came from within but was inspired by the overall culture of Customer Thermometer. Our new customer support person, in his first week in the job, received back an email from a customer saying thank you for his help, and ending the email with the phrase – “that’s magic, thank you!” This sowed a seed that quickly grew into our customer support team naming themselves the Ministry of Magic, and changing their job titles to “Customer Magician” instead of “Support Representative”. Once the Ministry of Magic started, there was no stopping it. Customers and prospects loved it, and really bought into the culture around it. Its reputation grew too, and one of things we’re most often asked about is how we deliver our customer support, how it’s structured. Our head of customer support (or the Minister of Magic) as we call him, probably gets about 3 job offers a week from our customers. We think that’s brilliant. There’s an old slide I have from years ago, which says “be times do equals have” – basically it’s shorthand for “act in the right way, do the right things, and you’ll have the right outcome”. This is exactly what the Ministry of Magic is all about. As we’ve grown, we’ve needed to hire people into our Ministry of Magic. In order to make sure that new starters know exactly how important their jobs are, we talked in our team meetings about creating a job description that could help them. I’ve always found job descriptions to be incredibly dry – they end up being a wish list of tasks that even the most multi-skilled human could never fulfill. We went back to the principle of “be” x “do” = “have”. 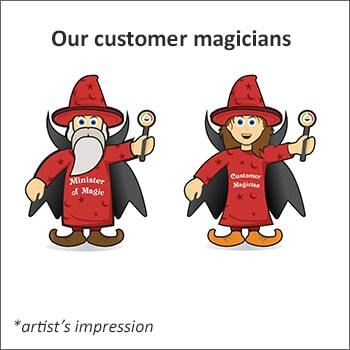 How do we help our new starters BE Customer Magicians? It was all about the behaviors and the approach they took – not about the tasks themselves. Now this is an awesome book. It’s the book I’d say most closely expresses what it’s really like to start and grow a business, hire and fire your friends and deal with the emotional fallout of it all. I recommend it all the time. However, there is also a brief excerpt in the book where Ben shares his experiences of trying to get his product managers the understand what he needed out of them. He created a document called “Good product manager, bad product manager” – which had instant and excellent results for him. This really hit home with me, and the Minister of Magic and I worked long and hard that week to create our own version, “Good Customer Magician, Bad Customer Magician”. The next Magician we hired absolutely knocked it out of the park on her first day. She knew exactly what was expected. The document has been an incredible success. Why we’re sharing one of our crown jewels. We’ve never shared this document beyond the confines of our offices until now. But it dawned on us that so many of our customers run support departments, and that this could help them. We know how hard it is. It’s an evolving field, and an evolving art, and we are proud to contribute if we can. This document has helped us enormously, and if it can help you too, we’re delighted to share it. Download it here, and please feel free to pass it on too. 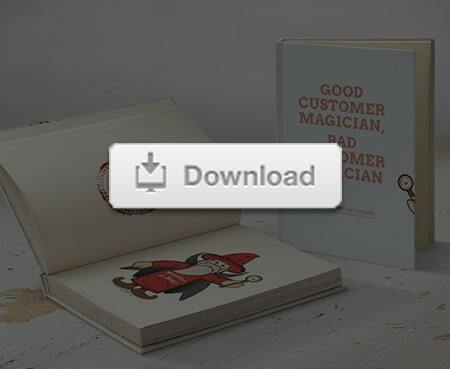 -Want to get customer support rating buttons for your email signature? Get a free account here. -Want to see the Ministry of Magic’s live ratings in real time? Click here.